← Injured while Traveling? How to Prepare for the Unexpected. There are millions of people today who are acting as familial caregivers to their parents, spouses or loved ones. Being a caregiver can be a very rewarding experience, but it can be a very stressful time as well. Caregiver stress is a very real and very serious problem for many people today. Stress brought on by caregiving for a loved one can happen due to the emotional and physical strain that it can cause. Many caregivers feel extremely overwhelmed by their responsibilities. They need to be “on call” 24/7 and suddenly their entire life becomes focused on the needs of the person they are caring for. Many caregivers stop looking after their own needs, stop enjoying their hobbies, and stop spending time with their friends and family. The stress of caregiving can not only have an emotional toll on caregivers, but it can also eventually have physical ramifications as well. Caregiver stress can lead to high blood pressure, headaches, extreme fatigue and insomnia in many individuals. This is why it is so important for caregivers to understand the best ways to handle caregiver stress. With proper stress management, caregivers cannot only experience fewer symptoms, but they can continue to enjoy a better quality of life while they are acting as a caregiver. The following infographic highlights different stress management techniques that can help. 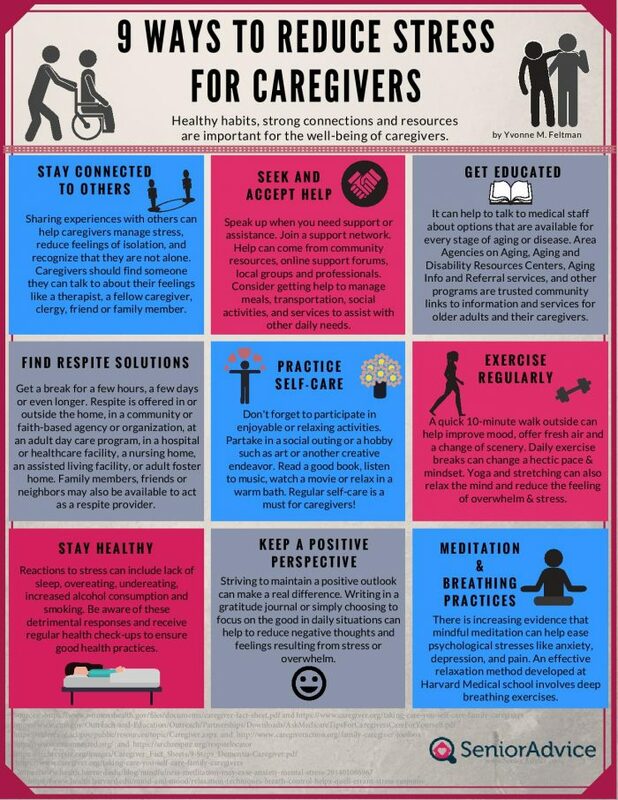 These caregiver stress management approaches can assist caregivers in managing their stress symptoms and regain a better sense of balance in their day-to-day lives. Managing stress will not only help caregivers with their personal lives, but it will also help them be better care providers to their loved one. After all, if a caregiver is happy and healthy, then he or she can to do their job to the best of his or her ability. Check out the tips in the following infographic by SeniorAdvice.com and consider implementing them in your everyday routine. They can go a long way in helping you manage your caregiver stress one day at a time.